Kitesurfing in Playa del Carmen, Mexico. Looking for a great Kiteboarding holidays? Amazing Scuba diving for no wind days? Crazy night life or relaxing family Resorts? Welcome to the unmatchable Carribean destination: Playa del Carmen. Playa Del Carmen is right in the middle of The Riviera Maya, also known as the Mayan Riviera, a tourism district following the coastal Highway 307 which parallels the Caribbean coastline of the Mexican state of Quintana Roo, located on the eastern portion of the Yucatan peninsula. Originally a small fishing town, Playa del Carmen, or just “Playa” as called by the Locals, became a world famous Scuba Diving destination right on top of the second longest barrier reef system in the world and rapidly developped over the past few years with many new luxury residential condominium buildings, restaurants, boutiques and entertainment venues. This is the place for sailing, Jet skiing, snorkeling,scuba diving , swimming in cenotes, swimming with dolphins, zip lining, horse riding, guided jungle tours and recently KITEBOARDING. 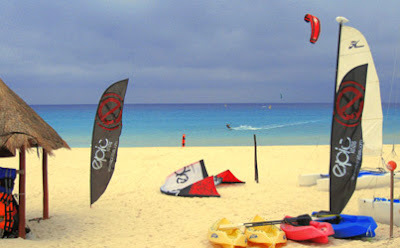 The beach of the Sandos Playacar Resort in playacar Hotel Zone is the main Kiteboarding Spot in the Area and also the only Authorized Kite beach and School of Playa del Carmen. Starting from the Sandos Playacar Resort toward south, you will find a designated mile long white sandy Kiteboarding beach with no rocks, no obstacles and a lot of space to rig and launch/Land your Kites. Right on spot is PDC KITEBOARDING SCHOOL, the only Authorized kiteboarding School of Playa del Carmen, which offers IKO beginner courses with International certifications, Equipment rental and supervision, Equipment sale and Demos. The staff is very friendly and speaks up to 6 different languages. On site you will find toilets, Shower and fresh water tank to rinse your gear off. The Resort offers 12% discount on your online Resort booking if you come for Kiteboarding. Ask PDC Kiteboarding to get the “Promotional Code”. The Wind season is from October till the end of May ( Sometime mid June). You should be able to ride 4/5 days a week during this period. Wind is usually from 13 to 22 Knots on the Caribbean coast and works with NE, E, SE and S.
NE wind is usually the best as it is a bit colder, denser and pulls much more. When the wind turns North (Called here “El Norte”), it blows from 25 to 35+ knots, and then you need to go to Isla Blanca Lagoon north of Cancun(ask PDC Kiteboarding about Lagoon excursion). If you are coming to learn and take your IKO certification course, if you like All inclusive Resorts, if you to have your family doing their own activities few feet away from the Kite area or if you just want to be as closed as possible from the Kiteboarding School and spot, the best option for you is to stay at the Sandos Playacar Resort which is right next to the spot. Also, as a Kiteboarder, you can get 12 % of your All Inclusive Resort booking with the special promotional code. Get in touch with pdckiteboarding@gmail.com to get the code. If you prefer small hotels downtown (only 7min by taxi to get to the Kite school/spot), there are hundreds of them right in the center of PDC. Have a look at “La rana Cansada”, http://www.ranacansada.com/. From Europe the cheapest is to fly from Brussels Airport, Belgium with www.jetairfly.com , straight to Cancun. Plenty of flights from USA and CANADA. This is not the newest kitesufing video, but still worth posting here for reasons that should be quite obvious… What we see in this video is the Ocean Rodeo team featuring Jeremie Tronet, Linn Svendsen, Shannon Best, Kris Kinn, Melissa Gill, Jon Mc Cabe and Juan Carlos Morales who seems to have find an awesome spot at the islands of Puerto Rico in the Caribbean.